Not only is the Middle East region young; it will grow by 40% by 2020. This means that the region will need to create 80 million new jobs, at a time when unemployment in this part of the world is already at an all-time high. While fears over oil and geopolitical stability cause investment into Middle East and North Africa (MENA) to fluctuate strongly, the sheer pace at which we are developing can bring with it significant opportunities. We are already one of the world’s most urbanised regions; our research tells us that our urban population will grow by 1,500 people a day over the next 35 years. This means that our cities, in having to keep up with that pace, will need to grow over decades, not centuries. The silver lining is a wealth of tremendous opportunities for private-sector investments. Faced with the very real threat of resource scarcity, can we find a comforting prospect? How humans use the Earth’s resources impacts us all, and nowhere is that more true than here in the Middle East. Our residents are among the most prolific users of water and energy. We’re already out of water and in 50 years we’re expected to have run out of oil, or will have seen it overtaken by other sources of energy. At summits and meetings across the region, technology is being proposed as a solution. Young people, in particular, espouse this view and, in a region dominated by youth, we should trust in their youthful optimism. In a recent survey conducted by World Economic Forum Global Shapers, an overwhelming 86% of respondents (all of them millennials) believe that technology is the answer, not the cause of the problem of unemployment. The potential benefits of the Fourth Industrial Revolution are enormous: our Middle East Industry 4.0 study has shown that digital transformation could generate $16.9 billion in extra revenue each year for companies in the Middle East from 2017 to 2021, as well as a further $17.3 billion in annual cost savings and efficiency gains. Earlier this year, as part of our Annual Global CEO Survey launched at Davos, we asked over 1,300 CEOs across the world what was their most important strategic priority going forward, and there too (you guessed it) digital came top of the list. 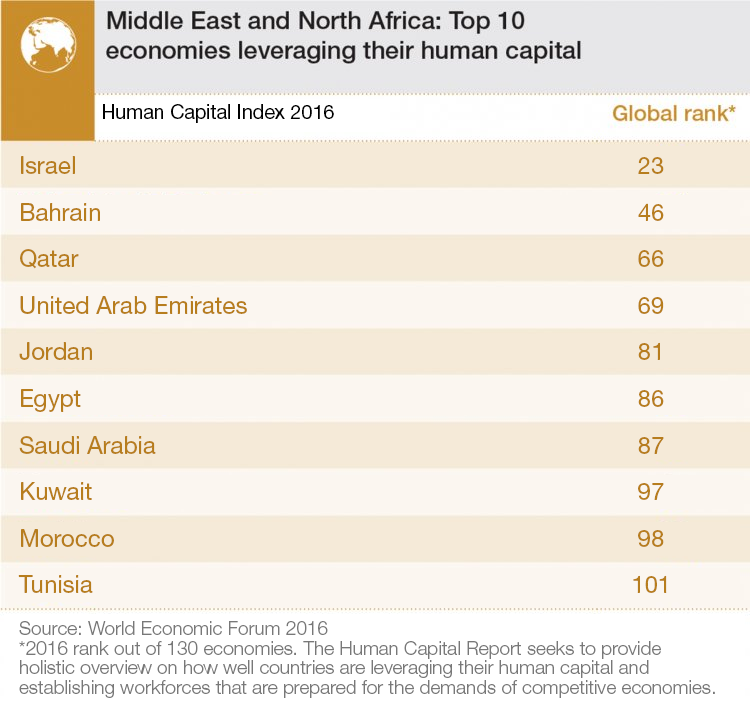 Of those we surveyed in the Middle East, the same was true, with technology, innovation and the convergence of talent the top priorities for Middle East business leaders. More than that, on the digital front, our region is leapfrogging straight to mobile. Our demographics have played a huge part in this shift, with young people turning us into one of the world’s fastest adopters of smartphones and social media. It is now Saudi Arabia that has the highest Twitter penetration in the world. These ingredients make for the perfect storm. Though we haven’t yet seen it drive growth and commerce significantly, like any natural phenomenon, it is real, and unstoppable. It is up to us to prepare for it and brace ourselves for what is to come. Doing so requires concerted, sensible and inclusive action. Governments in the region have started to make headway by investing considerably in education: 18% of total government spending in the MENA region goes to education, compared with the global average of 14%. But more needs to be done and fostering innovation and entrepreneurship through technology is a crucial place to start. Leaders today must know that it has become imperative to come together, trust one another, clearly communicate visions and values and listen to everyone whose fate is at stake – young and old, business leaders and policymakers, entrepreneurs and budding innovators – across the region. Exciting times lie ahead: the region is grappling with a perfect storm of powerful trends. The trick is to work on building trust and inclusivity while effecting “responsive and responsible leadership” as Professor Klaus Schwab has coined it. It’s the only way forward to solve some of the region’s most important problems and turn them into boundless opportunities. 1. Our region is very young. Shouldn’t our thinking be, too? The Middle East and North Africa is the youngest region on Earth and that should count for something. It is youthful, fresh and full of great ideas. It’s high time we started listening. At the meeting at the Dead Sea this year, 100 start-ups were honoured, most of them owned by millennials. While the young people at the Forum boasted impressive accolades, their presence was a constant reminder of the harsh realities of our region. The power of our young lies in their number – so too do their grievances. Youth unemployment in the MENA region, at 30%, is the highest in the world and double the world average. 3. “Looking forward to the future” is obsolete, in every sense. We are living and breathing the future, today. Technology and innovation is transforming the way we live, interact, negotiate and do business. And it is here, now. 4. Oil is no longer our region’s most valuable resource. Our youth and data are. In a lower for longer oil environment, and a region rife with instability, how can we turn these challenges into opportunity? Looking at the numbers, it becomes evident that we are in the midst of a perfect combination of adversity and initiative necessary to bring about much needed transformation to the region. At PwC, we looked at these through the lens of what we call the megatrends – global, long-term structural trends that come together to completely transform our world and reshape our future. We believe that how we manage these changes and seize the opportunities they bring with them, will define our success; as leaders, entrepreneurs, innovators, educators and human beings. Yes, the era of lower for longer oil prices creates the impetus for urgent action. But the direction and scale of change is driven by even stronger tides – megatrends – and our reactions to them.